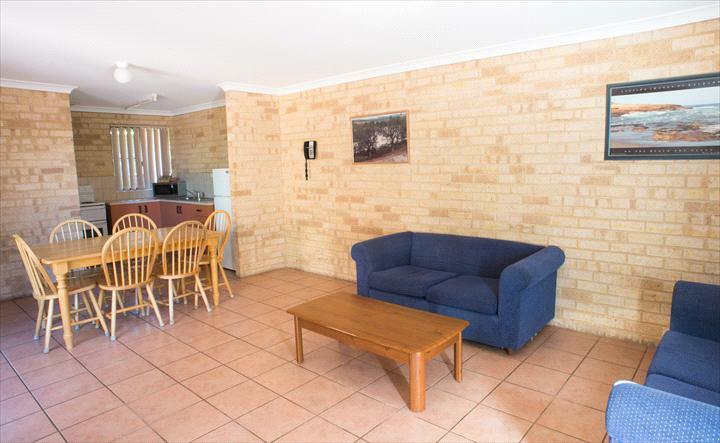 Located in the heart of tranquil Kalbarri with beaches, restaurants and shops within walking distance. 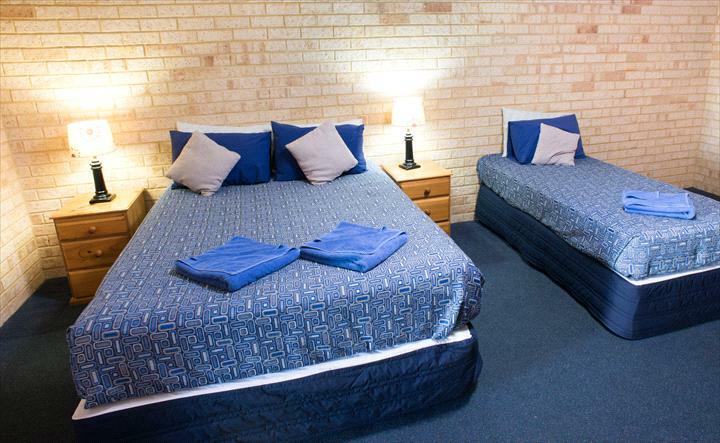 Kalbarri Palm Resort offers accommodation to meet your every need with our Executive Spa Suites, Deluxe Rooms, Motel Units and self contained Family Apartments all with quality amenities. Our family friendly resort covers a large area with ample landscaped lawns. Onsite Restaurant, Tennis court, Netted cricket pitch, lawn bowls, 2 swimming pools, heated outdoor spa and BBQs. These Cocos King Spa are perfect for a relaxing Couple Getaway!! 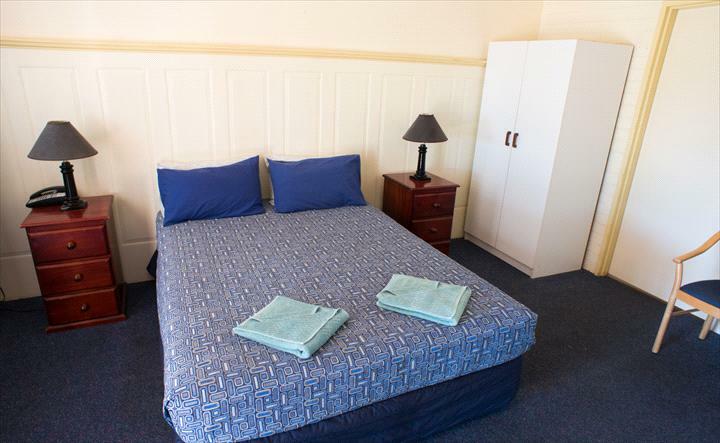 The unit features an open plan room with king bed, table & chairs and kitchenette combined. Basic kitchenette facilities include fridge, microwave, toaster & kettle . Welcome tea & coffee supplied. TV provided. Bath robes & all linen included. 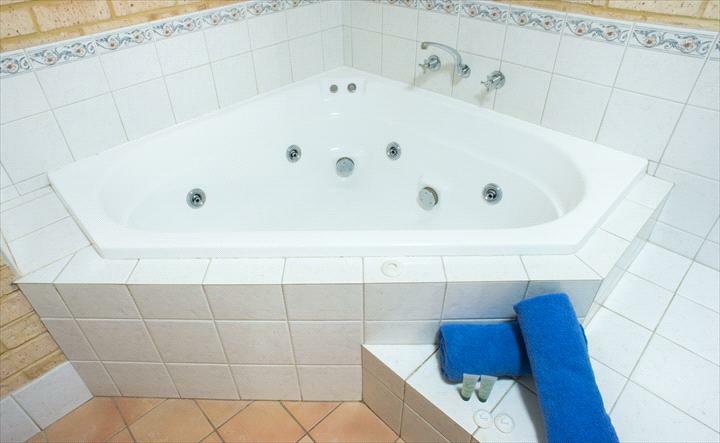 The large bathroom has a shower, toilet & spa bath. This unit is air conditioned & has a small heater. Balcony with outdoor setting. The Frangipani 2 bedroom Family Villa sleep up to 4, limited sleep up to 5 persons. These spacious apartments are an open plan design downstairs combining living, dining and fully functional kitchen. The upstairs contain 2 individual bedrooms consisting of a Queen bed and 2 or 3 singles along with a separate bathroom. The bathroom has a shower, toilet & washing machine. Welcome tea & coffee supplied. TV provided. All linen including beach towels is provided. This villa is air conditioned & has a portable heater. Balcony with outdoor setting. Please note: Some Villas have 3 single beds in the second bedroom, bookable on request only. Our Palm Family Suite sleeps up to 5 persons. The Palm Family Suite combines an open plan room with queen bed, table & chairs and kitchenette. The side room has either 3 or 4 single beds. 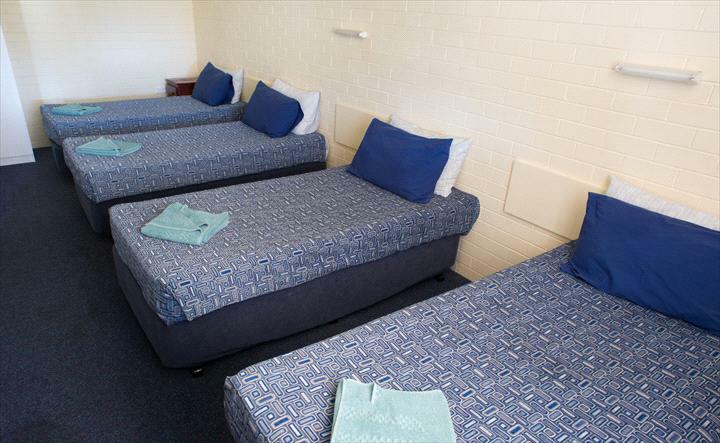 Kitchenette facilities include fridge, microwave, full size oven and cooking utensils, toaster & kettle . Welcome tea & coffee supplied. TV provided. All linen including pool/beach towels is provided. The bathroom has a shower & toilet. This unit is air conditioned & has a small heater. Outdoor porch with outdoor setting. Our Palm Studio is great for up to 3 guests. It features an open plan room with queen bed & single bed and small kitchenette combined. Basic kitchenette facilities include fridge, microwave, toaster & kettle . Welcome tea & coffee supplied. TV & all linen included. The bathroom has a shower and toilet. This unit is air conditioned & has a small heater . Outdoor Porch with outdoor setting.